Intek Instruments offers a superior range of PID Controllers in India. We deals in Brands, like,GEFRAN Italy, LUMEL Poland, SHIMADEN Japan, AUTONICS, QWINWELL Taiwan, and CARLO GAVAZZI Italy. We are a Distributor, Supplier, Dealer, Trader, Importer and Exporter in Delhi, Punjab, Uttarakhand, Uttar Pradesh, Haryana, Himachal Pradesh, Andhra Pradesh, Maharashtra, Gujarat, Arunachal Pradesh, Tamil Nadu, West Bengal, Kerala, Jammu, Kashmir, Bihar, Rajasthan, Madhya Pradesh, Chattisgarh, Odisha, Telangana, Karnataka, Jharkhand, New Delhi, Goa, India, and Nepal. 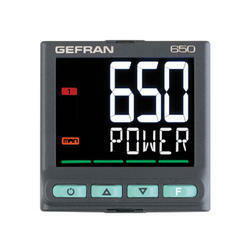 Intek Instruments is an Authorized Distributor for Gefran Italy in North India. The series 450 temperature controller, measuring 48x48mm (1/16 DIN), offers simplicity of use and high quality of control. The input from temperature sensors is "universal" and configurable with type J, K, R, S, T, B, E, N thermocouples and with 3-wire Rt100 resistance thermometers. 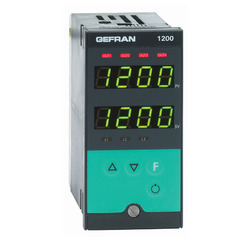 The user interface has a complete double display with green LEDs, 4 keys, and two red LEDs to signal active outputs. The Lexan membrane on the front panel guarantees an IP65 protection level for these products. The controller outputs, freely configurable as control output and alarm output, are available in a 5A/250VAC relay version or in a logic signal version to drive solid state relays. 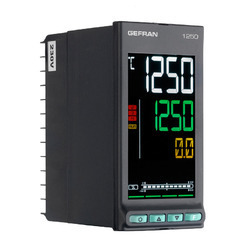 The input signal read speed (120msec) and the tested PID control algorithm with selftuning and autotuning parameter functions guarantee accurate and stable control even for rapid and discontinuous heating systems. 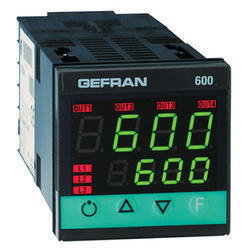 With the assistance of our diligent team of professionals, we have become competent enough to provide our esteemed clients with high quality Gefran 600 PID Controller that is extensively used in industrial control system. The controller provided by us is manufactured in adherence with defined quality standards by making use of quality tested components and the latest technology. Our clients can avail this controller from us at market leading prices. Our organization is indulged in offering a superior quality range of Configurable advance controller . 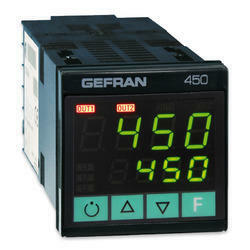 Our offered controller is widely used to minimize the error over time by adjustment of a control variable. This controller is manufactured by making use of the finest quality components and high-end technology in tandem with market quality norms and policies. Apart from this, we provide this controller at the most affordable prices to the clients. Microprocessor controllers, 48x96 (1/8DIN) format for 1200 and 96x96 (1/4DIN) format for 1300, built with SMT technology. Composed of 4 keys, double 4-digit green LED display, 4 red signal LEDs for the 4 relay/logic outputs and 3 additional LEDs with programmable function to signal the instrument's various function states. The instrument provides up to 4 outputs: relay (5A, 250VAC/30VDC cosϕ = 1) or logic (24V ± 10% (10Vmin a 20mA)).